I will try to demonstrate the process step by step. Let’s start! 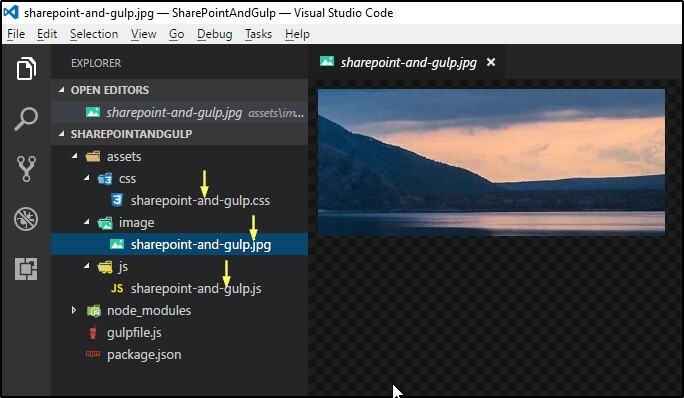 Obviously we can use SharePoint Designer or we can manually upload these assets to the SharePoint Master Page Gallery but as I mentioned earlier this process can be annoying sometimes. Luckily with the help of modern web development tools and few libraries we can do this elegantly. The very first step is to setup our environment. And this needs to be done only once. Ability to properly version your files in local or remote repository. Depending on the operation system, it gives nice command line or GUI tools. 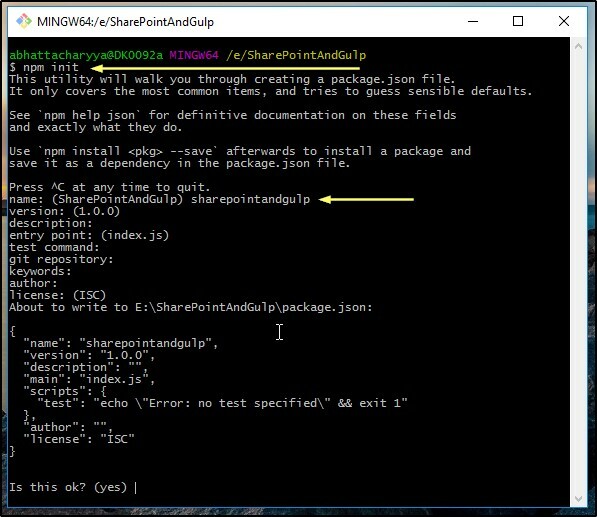 We will be using the shell Git Bash that it provides. 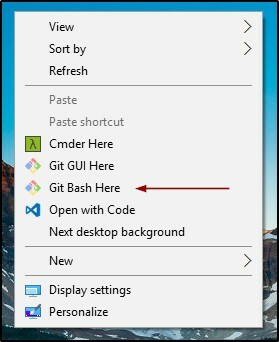 However, we can use default windows command prompt or other utility like Cmder to run Git commands. To install this download the latest stable build from the official site https://nodejs.org/en/ and follow the instructions. Here, we will be using only npm the command line utility. Gulp is basically a task runner. Gulp itself has very few methods and commands, but using these methods and with the help of node packages we can create powerful tasks. To make the Gulp commands available globally we need to install the gulp node package globally. In the prompt run the following command to install it globally. 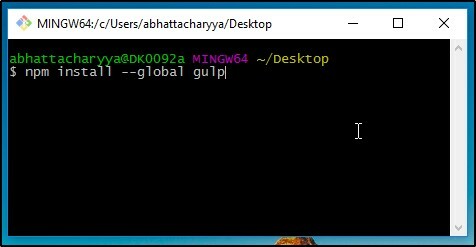 To check if gulp is installed properly or not run the command below. If everything is OK you should see the version number as shown in the screenshot. Create a directory in your workspace. 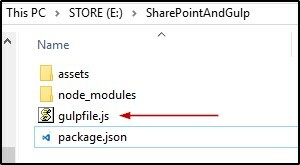 For example, lets say root folder name is “SharePointAndGulp”. Go to the folder from command prompt and run the command below. It will ask for inputs but for now choose the defaults by pressing Enter. And at last press Enter again to give your consent to create the json file. Create a folder here. We will keep our source files and assets in this. Let’s name it “assets”. The hierarchy of this folder shown below. We will have to install two node packages for this example. The packages are gulp and gulp-spsave. You must be thinking why to install gulp again locally. 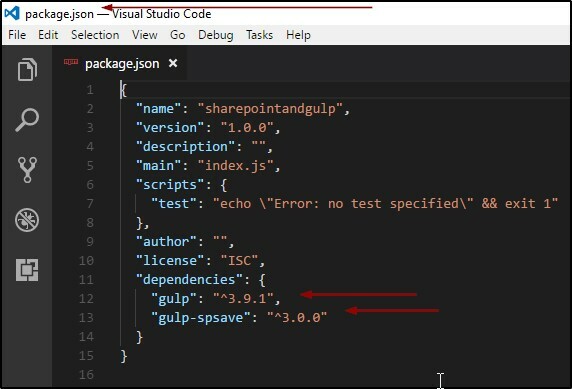 The reason is gulp tries to run the gulp configuration file (gulpfile.js) using the local version of gulp. Whereas the global version gives us the gulp command available globally. By the way, the gulp configuration file (gulpfile.js) is where we write our gulp tasks. 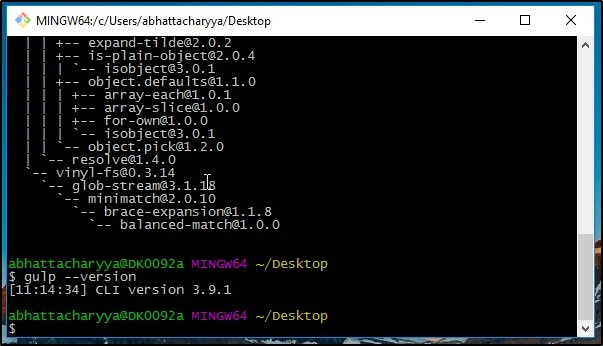 Navigate to the root folder in command prompt and run the command below. After running this command two things happen. One folder named “node_modules” gets created and this folder contains all the packages. The --save switch adds the packages to the json file. So, create a file named gulpfile.js in the root directory. We will write a task that will upload all the files from the “assets” folder to SharePoint master page gallery. Let’s say the name of the task is “upload”. Open the entire folder in an editor. I prefer Visual Studio Code. Paste the code given below. Also see the screenshot to have an idea of the different pieces. Change the properties like siteUrl, folder, username and password and save the file. Before running the task, we need to add some files in the assets folder. If no files fund then it will not upload anything. So, let’s create few files and add some contents. Open command prompt/ Git Bash again and go to the root directory and run the command below. The progress can be seen in the console. Once uploaded notification will also appear. To verify go to the SharePoint site’s master page gallery and check the folder. So, we have successfully uploaded the files with the help of node.js, npm, gulp and a node.js package called gulp-spsave. We can do much more than this using gulp. We can do minification of code, bundling of code, create dynamic file and all kind of things that is needed in a development workflow. 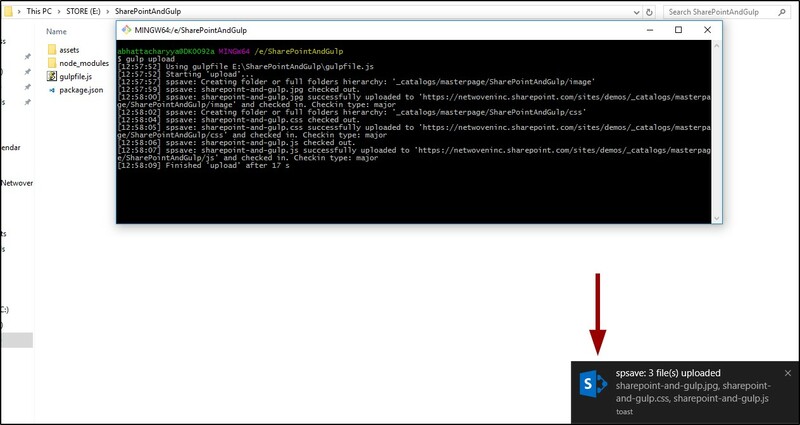 If we are not into development we can still use this method to upload our files to SharePoint Document Library. The files we need to upload do not need to be in the same folder as in the example. We can setup the and create the task at one place and by giving the physical path we can still upload files. 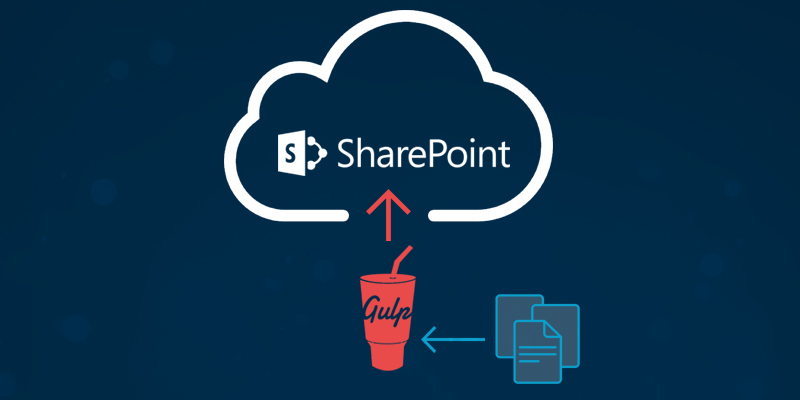 We can even create a gulp task that watches for any changes in file and then upload to SharePoint if there is any change. 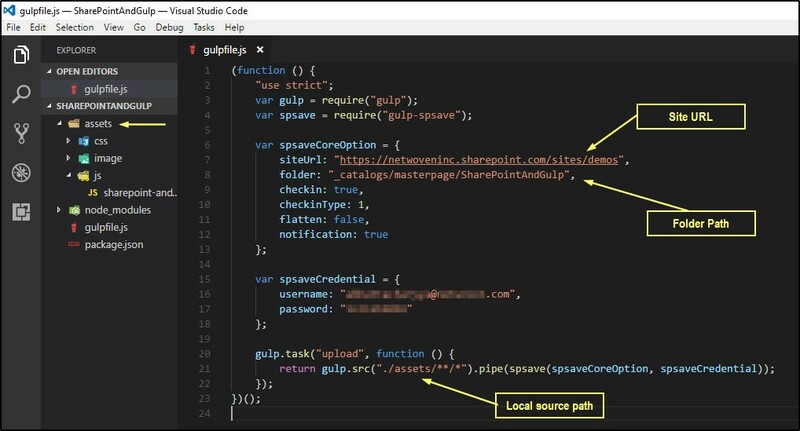 So, next time when you need to upload some files to SharePoint and if you need update the content of those files locally and then upload them frequently then you can have this setup in your machine.